Product #21690 | SKU MK5 | 0.0 (no ratings yet) Thanks for your rating! The Etymotic mk5 High-Fidelity Isolator Earphones combine the company's Accu-Chamber technology in a compact low-profile high-gloss design. The design makes the earphones fit comfortably with hats and helmets, so they are especially convenient for commuting, travel, and sports activities. 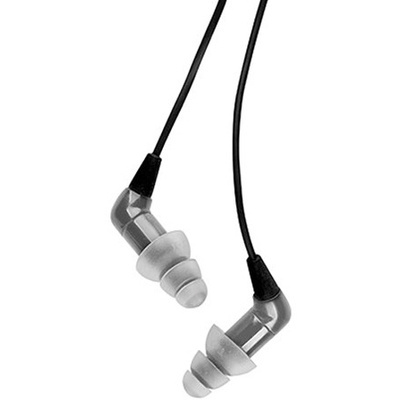 The earphones use high-output 6mm neodymium moving-coil drivers to deliver a frequency response of 20 to 15,000 Hz into a 32 ohm load with a sensitivity of 95 dB and a maximum SPL output of 120 dB. The eartips provide 35 to 42 dB of noise isolation, and a custom earmold fit option is also available for even greater noise isolation. A collection of foam and gel eartips as well as a shirt clip and zippered carrying pouch are included. A cord winder and deluxe zippered carrying pouches are also available (sold separately).